Aqueduct in Queens, New York will be scene of one of the two important qualifying races toward the Kentucky Derby this Saturday, April 5 when the TwinSpires.com Wood Memorial is contested. Some of the best three year olds in the land will be after the winner's share of the $1 million purse and the valuable 100 points that goes along with it when they go 1 1/8 miles on Aqueduct's main track. The Grade 2 Gazelle Stakes comes our way from a very busy Aqueduct in Queens, New York on Saturday, April 5. A purse of $300,000 will be on the line for three years old fillies willing to go 1 1/16 miles on Aqueduct's dirt track. The Grade 1 Carter Handicap is on tap for Aqueduct in Queens, New York this Saturday, April 5. Horses three years old and upward will be featured as they go seven furlongs on Aqueduct's dirt track for a purse of $500,000. Aqueduct in Queens, New York will be the scene of the Grade 3 Bay Shore Stakes this Saturday, April 3. A purse of $300,000 will be on the line for three year olds willing to dash seven furlongs on Aqueduct's main dirt track. Keeneland Race Course in Lexington, Kentucky will play host to the Grade 3 Transylvania Stakes this Friday, April 4 - opening weekend of their spring/summer meet. The race will feature three year olds willing to go 1 1/16 miles on Keeneland's turf track in search of the winner's share of the $100,000 purse. 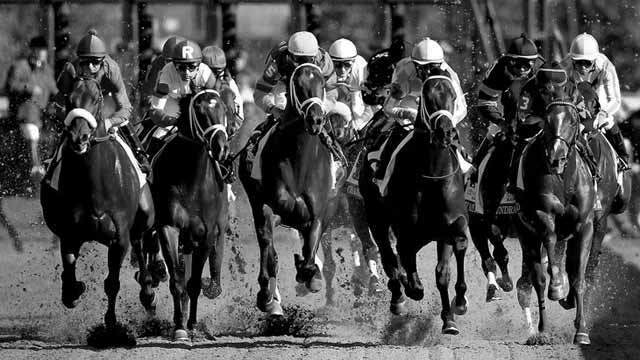 The Road to the Kentucky Derby became more like a freeway this past weekend when we saw the points values for the qualification races jump from 50-20-10-5 for the first through fourth place finishers to 100-50-20-10. Three huge races on Saturday have led to a complete reshuffling at the top of the standings - the UAE Derby was contested at Meydan, the Louisiana Derby was run at Fair Grounds and the Florida Derby took place at Gulfstream Park. The Grade 3 Tokyo City Cup comes our way from Santa Anita Park in Arcadia, California on Saturday, March 29. A purse of $100,000 will be on the line for horses four years old and upward willing to go 1 1/2 miles on Santa Anita's main track. The Grade 2 Pan American Stakes comes our way from an intensely busy Gulfstream Park in Hallandale Beach, Florida this Saturday, March 29. Horses four years old and upward will be featured as they go 1 1/2 miles on Gulfstream's turf track searching for the winner's share of the $200,000 purse. The Grade 2 Gulfstream Park Oaks, a major prep for the Kentucky Oaks in May is on tap from a very busy Gulfstream Park in Hallandale, Florida on Saturday, March 29. Three year old fillies will take to Gulfstream's main track and go 1 1/8 miles for the winner's share of the $300,000 purse and the 100 qualifying points toward the Kentucky Oaks in May. Gulfstream Park in Hallandale Beach, Florida will be the scene of the 63rd running of the Grade 1 Besilu Florida Derby on Saturday, March 29. Some of the best three year olds in the land will be after the winner's share of the very nice $1 million purse and the 100 qualifying points towards a start in the Kentucky Derby when they go 1 1/8 miles on Gulfstream's main track.